Combine all the brine ingredients in a pot and heat to dissolve the salt and sugar. Cool, then refrigerate. When cold, add the pork loin and refrigerate for 3 days. Remove the loin, rinse well and discard the brine. Pat the pork with paper towels then set on a rack to dry uncovered in the fridge overnight. Resting distributes the brine and the drying allows the smoke to better penetrate the pork loin. If you don’t have time to smoke this yet, skip the drying part until the night before. The cured loin will hold for at least a week. Fire up your smoker You want a temp of around 200-250. At the moment I have apple wood for my smoke, but use what you like. Cherry would be dynamite here. When you’re ready, coat your pork loin in the Sichuan peppercorns and coriander, pressing in the rub. 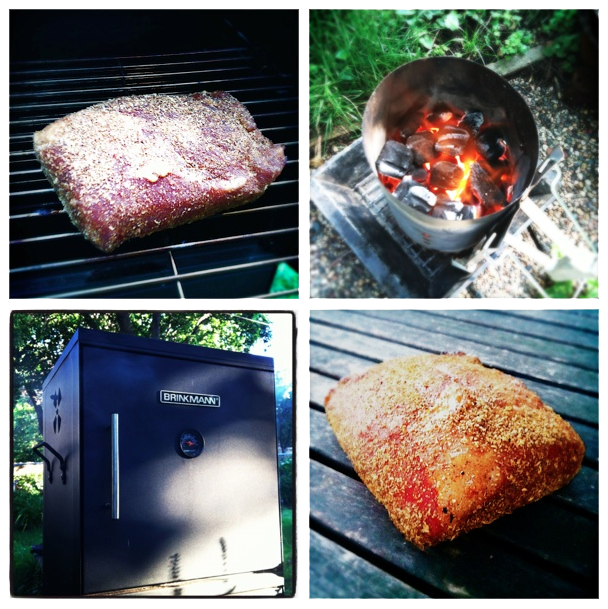 Hot smoke the loin to an internal temp of 150. Mine took about 3 hours at 200 degrees. Store in the fridge until ready to use, either hot or cold. I plan to use mine in fried rice, sautéed in stir fry and layered with spicy hollandaise in eggs benedict. Or maybe with pickled duck eggs. Or in bao. I must be hungry.